TOKYO – Sounding one of his most dire warnings yet about the rapidly changing auto industry, Toyota President Akio Toyoda is shuffling top management to tackle what the automaker calls a “now or never” competition “about surviving or dying” in the new era. The changes aim to tighten ties with Toyota Group companies, such as suppliers Denso and Toyota Tsusho, and bring in expertise that Toyota Motor currently lacks. The overhaul also promotes new perspectives by elevating a woman to a top leadership role in the Lexus luxury brand and by promoting more non-Japanese at executive levels. Toyoda, grandson of the company’s founder, is stoking a crisis mindset at Toyota in a bid to keep the giant company nimble and responsive to cataclysmic change besetting the industry, from a rush of new technologies to new competitors from Silicon Valley and China. “Surrounded by changes of unprecedented speed and scale, TMC is aware it faces a ‘now or never’ situation in which not a moment can be spared,” the company said in a statement outlining the appointments. Toyoda echoed the alarm in his personal comments. The shuffle is part of a new organizational structure Toyoda introduced last year. To speed decision-making and unleash creativity, Toyoda broke the Japanese parent company into subcompanies empowered to act as self-contained units. The goal is to replicate the streamlined operations of the Silicon Valley startups triggering so much angst. 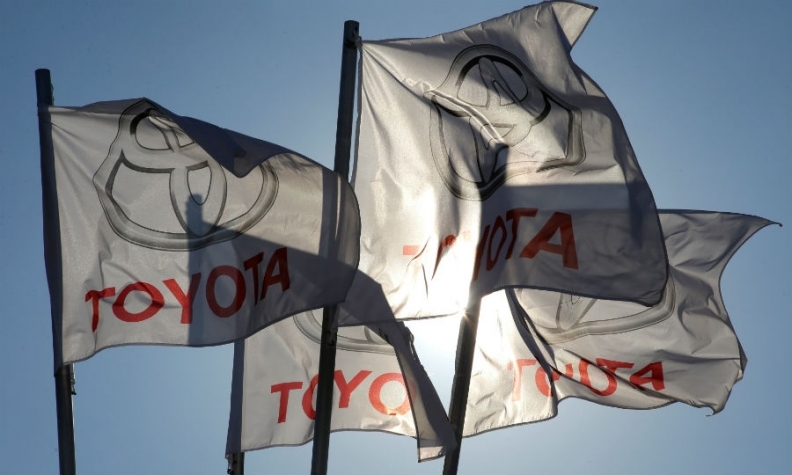 Some of the management changes tighten ties with Toyota Group companies. Denso, for instance, is sending its vice chairman, Koji Kobayashi, to become Toyota’s new chief financial officer. Brake-maker Advics is sending its president, Satoshi Ogiso, back to Toyota to be president of its commercial vehicle company. Ogiso previously worked at Toyota, where he was known for his work on the automaker’s trademark hybrid technology. Meanwhile, trading company Toyota Tsusho will send Executive Officer Toshimitsu Imai to serve as a managing officer and CEO in charge of Toyota’s Africa regional operations. Other changes bring in outside expertise. A managing director at Japanese megabank Sumitomo Mitsui Banking, Akihiro Fukutome, will join Toyota as CEO of Toyota Financial Services. Gill Pratt, the American computer whiz who heads the Silicon Valley-based Toyota Research Institute, assumes a newly created position of “fellow” at the parent company in Japan. A fellow shares the same status as executive vice president. The title is reserved for the “ultimate level of technical expertise” within the company, a spokesman said. Pratt is the first fellow; others are expected to be added later, Toyota said. Gender diversity is further promoted with the appointment of engineer Chika Kako to the role of executive vice president at Lexus International Co. She was Toyota’s first female chief engineer and served in that role on the Lexus CT hybrid hatchback. Globalization also gets a boost with the advancement of two non-Japanese. Designer Simon Humphries moves from Toyota Europe Design Development to the parent company as executive general manager for design at the Advanced R&D and Engineering Co.
American Michael Sweers, chief engineer of the Tacoma and Tundra pickups and the Sequoia and 4Runner SUVs, was also appointed executive general manager, at the commercial vehicle subcompany. He is stationed in Japan with a staff in that country and in North America. The executive general manager positions were created in April as hubs of technical expertise. Among other appointments, Senior Managing Officer Shigeki Tomoyama was elevated to executive vice president and adds more responsibility to his already wide portfolio. Tomoyama will now be chief officer of the Toyota Production System Group, on top of his duties as chief information security officer, president of the Gazoo Racing and Connected companies and chief officer of the Information Systems and Business Development groups. Senior Managing Officer Moritaka Yoshida, currently president of the Midsize Vehicle Company, which oversees nameplates such as the Camry sedan, will also be promoted to executive vice president. In that role, he adds responsibilities for the TNGA Management Division, which coordinates work on the carmaker’s new modular vehicle platform.